Not long ago I was reading a book I received as a Christmas present, More Desired than Our Owne Salvation, The Roots of Christian Zionism. On page 72 I came across this sentence: "In 1605 [English] authorities discovered the 'Gunpowder Plot' designed by Catholics to assassinate [King] James as well as the Puritans then sitting in Parliament." Several years ago I addressed this event in a blog post. I wrote, "November 5 is Guy Fawkes Day. In 1605 thirteen young men conspired to blow up Britain's House of Parliament. Among them was Guy Fawkes, a Catholic who protested the Protestant government of his day. The 'Gunpowder Plot,' as it was called, was thwarted, and the leader, Guy Fawkes, was caught, tortured, and executed. Since that time Britons commemorate the capture of Guy Fawkes with bonfires and fireworks, and by burning an effigy of Guy, or sometimes of the Pope. "Interestingly, the memory of Guy Fawkes continues 400 years later on Ocracoke Island (albeit in a diminished and corrupted fashion) in a now rare saying. If an islander is thought to be up to no good, hiding his malicious intentions, an islander might comment, 'He's sneakier than old Guy Hall.'" Anyone want to organize a bonfire on the beach next fall in memory of "Guy Hall"? On January 20, I mentioned the book Deep by James Nestor...and the sport of freediving (underwater diving without the aid of any artificial breathing apparatus). I knew virtually nothing about freediving before reading the book, but became convinced that there must be some video documentation of the sport on the Outer Banks. 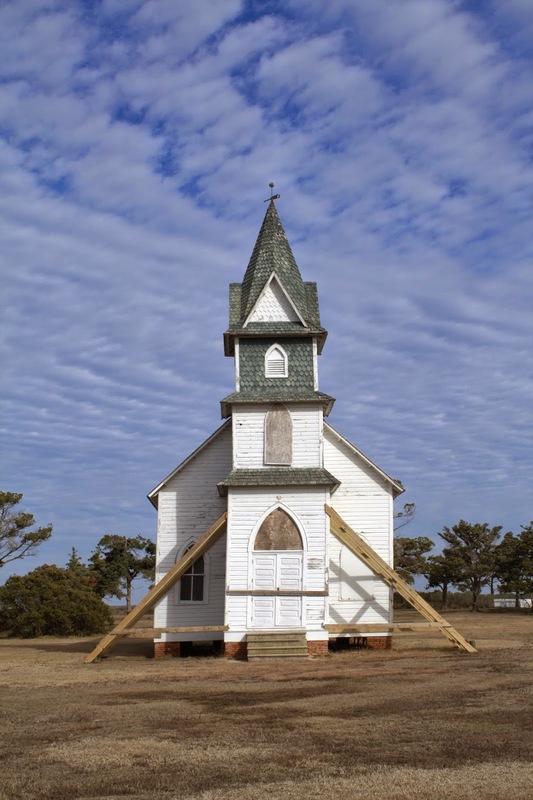 I soon discovered Hidden Outer Banks, an online magazine published by Dawn Church, who lived on Ocracoke for a while, and helped create the Ocracoke Observer. Dawn has shared Russel Blackwood's 2 1/2 minute video of his freediving the shoreline of Cape Hatteras. 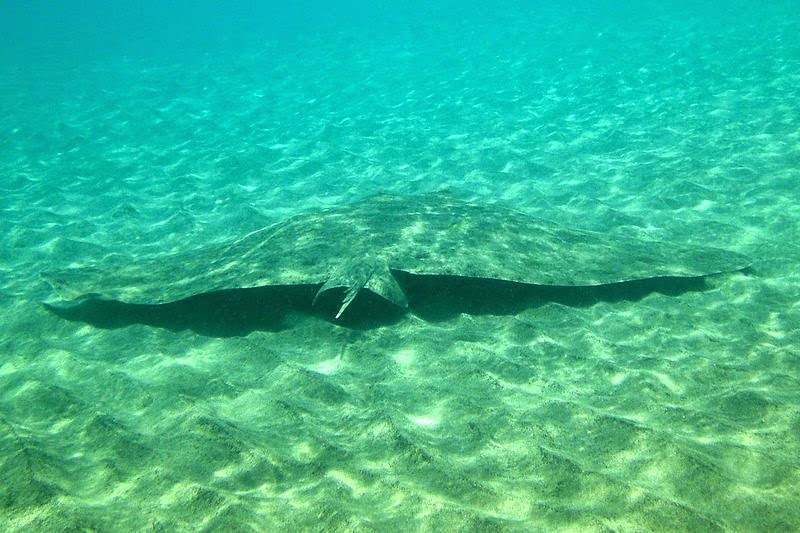 It shows spectacular footage of a butterfly ray: http://www.hiddenouterbanks.com/flight-of-the-butterfly-rays-russell-blackwood/. Take a few minutes to enjoy this up-close underwater encounter with a beautiful swimmer! 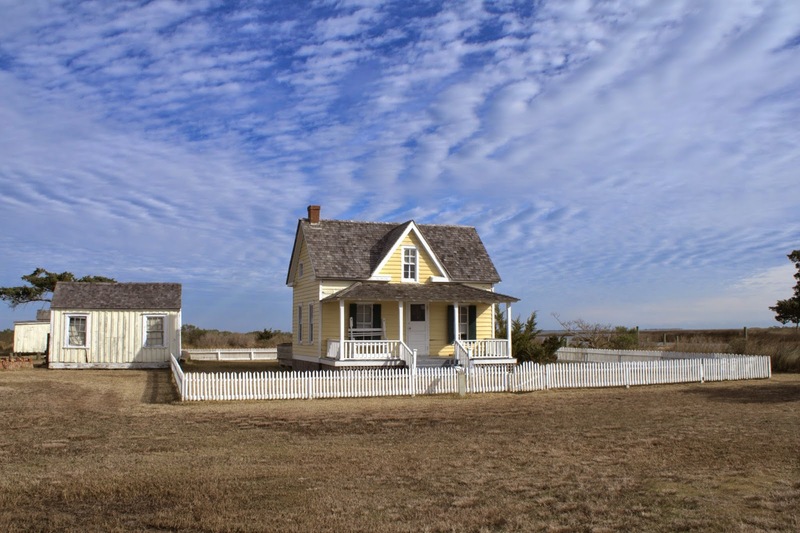 Fences have long been an important part of Ocracoke village. In years past, islanders often had two fences surrounding their houses...one to separate the garden from the yard, and another to protect the garden from roaming wild horses. In addition, each small family cemetery was typically enclosed by a picket fence. The fence in the photo below is new, but it looks old...to match the small cemetery it surrounds on Howard Street. 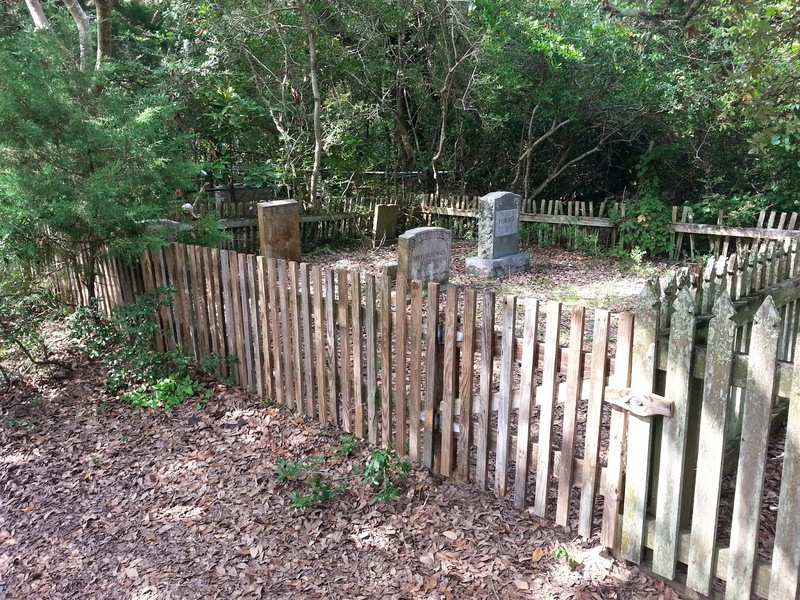 The original fence around the Wheeler and Tressie Howard graveyard on Howard Street had deteriorated, so the family hired island carpenter, Len Skinner, to build a new fence just a few months ago. He did a terrific job of matching the existing wooden fence with sturdy, weathered boards. You would think the fence had been there, protecting the graves, for decades. Farnifold Green (born May 30, 1674 in Virginia) arrived in North Carolina in July of 1697. On December 20, 1707, the Lords Proprietors issued Farnifold Green a land grant for 780 acres—part of the land that would eventually become early Beaufort. Green, a planter, colonial militia officer, commissary, and Indian fighter had a plantation on the north side of the Neuse River (see http://beaufortartist.blogspot.com/2007/11/farnifold-green-owner-of-first-land.html for more information). "...Farnefould Green humbly sheweth That whereas your honors humble orator haveing a great desire to settle a stock upon the Banks at or near Occacok Inlett and haveing understood that the honorable Governor hath given orders that the said Places should not be settled by any straingers but what are of good fame, least any harme should befale any of her Majestys subjectes that should through Chance be Cast away there, Therefor your humble Orator prays Lycence from your honors for the settlement of the same, and Your humble Orator shall as in duety bound for ever pray etc. Farnefould Green." "Upon Petition of Farnifold Green praying he may have Liberty to Settle upon the Sand banks neare Okacock Inlett. Ordered that the Said Farnifold Greene have Liberty to Setle on the Said place accordingly." We don't know exactly what stock Farnifold Green brought to Ocracoke, but it likely included cattle, sheep, and/or goats. Perhaps horses as well. All of these domestic animals were still grazing freely on Ocracoke Island in the 1950s, when I was a boy. Many of our readers will remember that the National Park Service had intended to eliminate all funding for Ocracoke lifeguards last summer. After protests from islanders and visitors, the NPS relented and appropriated funds to provide lifeguards five days a week. The Ocracoke Civic & Business Association agreed to fund the other two days in spite of concerns that that was sending the wrong message to the NPS. Fears were raised that it would be an incentive for the Park to continue cutting funds for lifeguards. Earlier this month the Ocracoke Current reported that the new Superintendent of the Cape Hatteras National Seashore, Dave Hallac, "said that the current plan is for NPS to hire contracted lifeguards again this year, to staff the three beaches in the Seashore that traditionally have lifeguards (Ocracoke, Buxton, and Coquina Beach), and to pay for lifeguard services for seven days a week. NPS has initiated the contract process." Read more here: http://www.ocracokecurrent.com/104577. Hallac is scheduled to attend the monthly meeting of the Ocracoke Civic and Business Association on February 11. Eliza Ella ("Miss Lizerella") Styron O'Neal (1890-1953) was the daughter of Elijah Styron, Sr. and Elizabeth Gaskins Styron. The Styrons are an old island family (I mentioned them last year because they were one of the last Ocracoke families to continue celebrating Old Christmas). Two grandchildren and four great-grandchildren live on the island to this day. Miss Eliza Ella's great-grand-nephew told me she had never driven in an automobile. In fact, she never left the island in her entire life (except to venture a mile or so out into Pamlico Sound in a small boat). Carl Goerch relates his visit and conversation with Miss Eliza Ella ("Never Been Off the Island") in his 1956 book, Ocracoke. Goerch describes Miss Eliza Ella as "friendly and vivacious." Cousin Blanche agreed, and recently shared a story that illustrates Miss Styron's wonderful sense of humor. In the 1920s, when airplanes were still a novelty, and barnstorming pilots occasionally flew out to Ocracoke, local talk turned to speculation about this new and exotic mode of transportation. Some folks were ready to hop into the cockpit of a plane to see the island from the air. Others were dead set against such foolhardy behavior, and vowed to never, ever, get into an airplane. Miss Eliza Ella had her own unique perspective, and addressed the assembled neighbors. "I don't care high up I go," she said, "as long as I can keep one foot on the ground!" Julie Williams Dixon, writer, photographer, storyteller, and observer of life, has published a gallery of Ocracoke and Portsmouth photos. 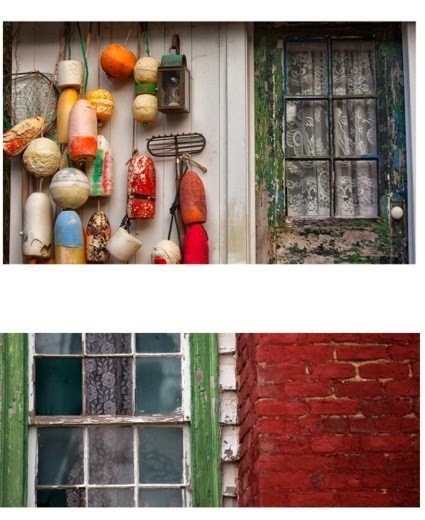 The composite below is of my outbuilding (Mad Mag's Studio) and a window in Plymoth, NC. To view Julie's gallery, and see an older photo of my building, click on this link: http://juliewilliamsdixon.com/?page_id=402. I hope you enjoy the pictures. We have published our latest Ocracoke Newsletter. This month's story is about the almost forgotten 1890 "Oyster Wars" that pitted islanders against outside business interests. You can read the article here: http://www.villagecraftsmen.com/news012115.htm. My son and his family gave me a fascinating book as a Christmas present: Deep by James Nestor. Deep is about "Freediving, Renegade Science, and What the Ocean Tells Us about Ourselves." I wasn't so sure I would find the book to my liking. I have absolutely no interest in freediving (underwater diving without any breathing apparatus such as scuba equipment), especially (and I repeat, especially) extreme freediving. In June 2012, Herbert Nitsch, World Record Holder Freediver, dove to a depth of 253.2 meters (831 feet) on one breath of air! 831 feet is the height of a 100 story building! However, because I live on an island in the Atlantic, I was intrigued by various facts about the ocean that I learned from the book. For example, Nestor writes that "Every year on the same day, at the same hour, usually within the same minute, corals of the same species, although separated by thousands of miles, will suddenly spawn in perfect synchronicity. The dates and times vary from year to year for reasons that only the coral knows." With a little research on the Internet I discovered this beautiful 2 1/2 minute video of coral spawning in the Gulf of Mexico: http://www.oceanfutures.org/learning/kids-cove/creature-feature/coral-spawning. Another wonder of Nature! 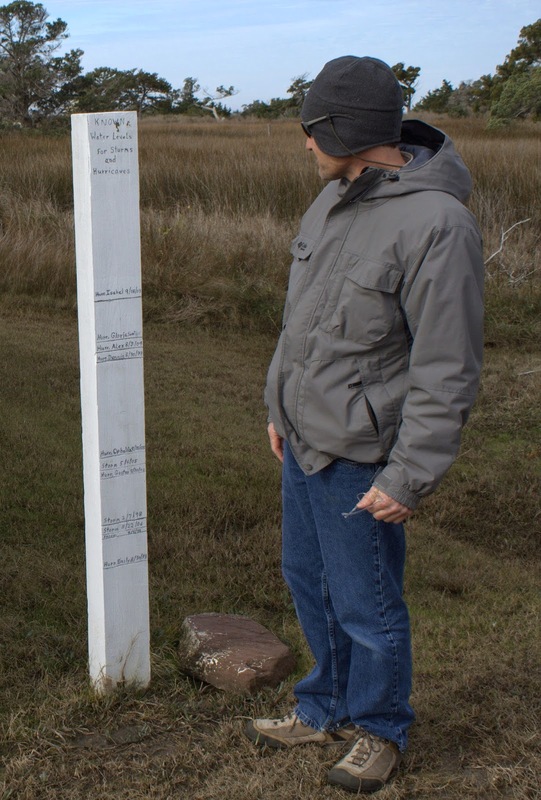 Our current Ocracoke Newsletter is the seldom told story of the 1837 murder of Willis Williams by Jacob Gaskill. You can read it here: http://www.villagecraftsmen.com/news112114.htm. Two native islanders died early this month. Bernice (Bunny) Gaskins, 90, died at her home on Loop Road on New Years Day. Bunny was the daughter of the late Irving and Alma Bragg Forbes and the widow of John Gaskins. 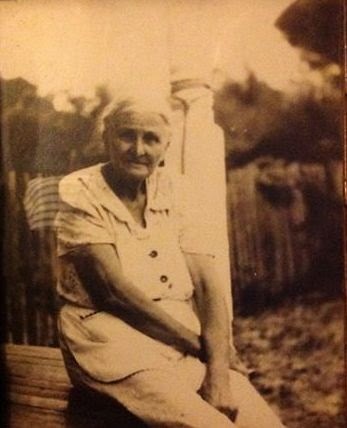 You can read her obituary on the Ocracoke Current: http://www.ocracokecurrent.com/10382. On January 2, Rhodes Ignatius (Iggy) Styron died. He was quite a colorful character. 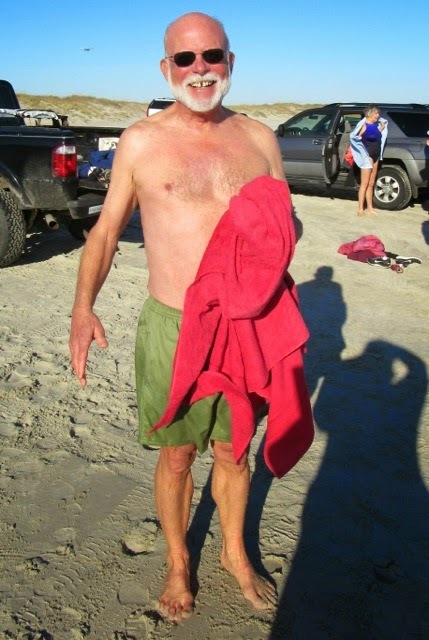 You can read his obituary here: http://www.ocracokecurrent.com/104729. Born in 1944, Iggy used to spend hours on the Community Store porch, drinking Coca Colas, eating snacks, and greeting friends and visitors. As you might imagine, he often offered a unique perspective on life. Ignatius had a penchant for unusual attire -- sleeveless t-shirts; sunglasses; silver bracelets, earrings and rings; a soul patch; and spiked hair. His hair was often colored (he chose red, white, and blue for July 4th). Lou Ann and I frequently biked down to the store just to spend time with Iggy. He didn't say much, but even in his most taciturn moments, he was a pleasure to chat with. In recent years Iggy gave up on his more outlandish appearance, and we only saw him occasionally when he drove his golf cart to the NPS docks to watch boats coming and going in the harbor. Our most memorable visit with Iggy occurred at the Community Store. A gentleman whom I did not recognize stepped up to the porch, gazed right and left, and just stood there for a time without saying anything. Finally he addressed Iggy with a few words, then turned and walked away. I asked Iggy if he knew the man. "Yes," Iggy replied, "he comes to the island several times a year. He's really weird." Farewell Bunny & Iggy! Island life is always impoverished when those of our own depart. About 25 years ago a young man from Statesville, NC wandered onto Ocracoke Island, and like so many others, remained here for a while. He secured housing, found work, and stayed long enough to befriend a number of locals. Unlike most, he arrived on foot. Marty Harris had walked across North Carolina carrying about 75 pounds of equipment (including clothes, a sleeping bag, a small tent, and his camera). Along the way Marty documented his trek with photographs. It was always his goal to publish a book of his pictures. Finally, after a quarter of a century, that book is a reality. What The Road Passes By: A Photographic Collection of People and Places in North Carolina was published August 15, 2014. The photographs are stunning, and capture the essence of people and places from the mountains to the coast of the Tarheel state. What the Road Passes By is available at local bookstores and on Amazon. If you love North Carolina, you might want to get one for yourself or for friends. The Ocracoke Foundation continues to support our community by initiating and implementing projects that focus on environmental stewardship, responsible economic development, and education. One of the Foundation's major current projects is the Revitalization of the Community Square. 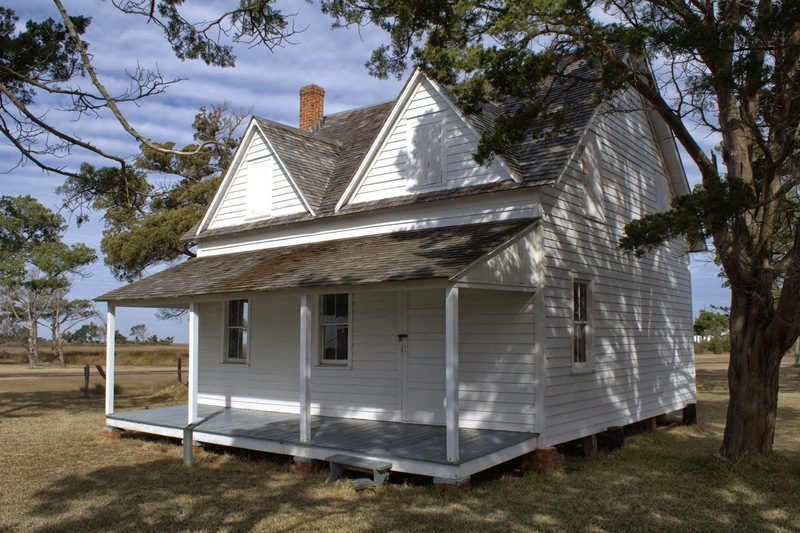 The Ocracoke Foundation continues to work hard to protect and preserve vital aspects of the island's traditional culture. Donations to further their work are always appreciated. Follow this link to make a charitable contribution: http://www.ocracokefoundation.org/donate/. Katharine is an immature, female White Shark (Carcharodon carcharias) that was first tagged in August, 2013 at Cape Cod. She has visited Pamlico Sound once before, and has been back recently...on January 9 & 10. Two days ago she was back in the Atlantic Ocean north of Cape Lookout. You can track Katharine here: http://www.ocearch.org/profile/katharine/. You might also want to track any or all of the 100 sharks that have been tagged by OCEARCH, a non-profit organization with a global reach for unprecedented research on great white sharks and other large apex predators. On Wednesday, January 7, I published several photos that my grandson took on our trip to Portsmouth Island. A reader left this comment: "All the buildings are low on the ground. Does Portsmouth ever get tidal floods?" I promised to publish a photo that Eakin took of tide lines beside the Post Office that document various storm tides between 1985 and 2013. That's my son, Stefen, standing beside the markers. 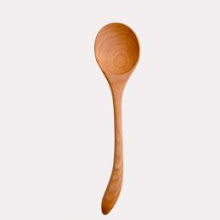 Click on the photo to enlarge the image. As you can see, tide from Hurricane Isabel reached as high as his chest. I believe every building on Portsmouth has been flooded several times. 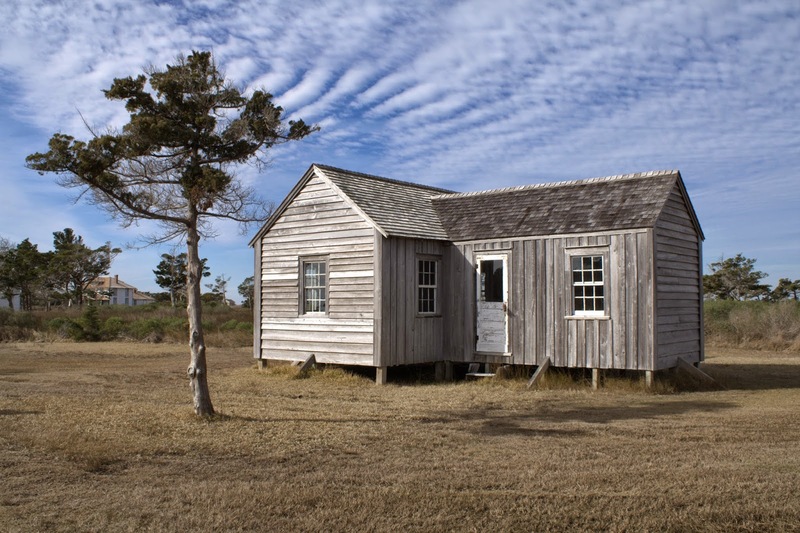 The first mention of a school on Ocracoke was in 1785 when school master Henry Garrish was hired to teach young Thomas Wahab. 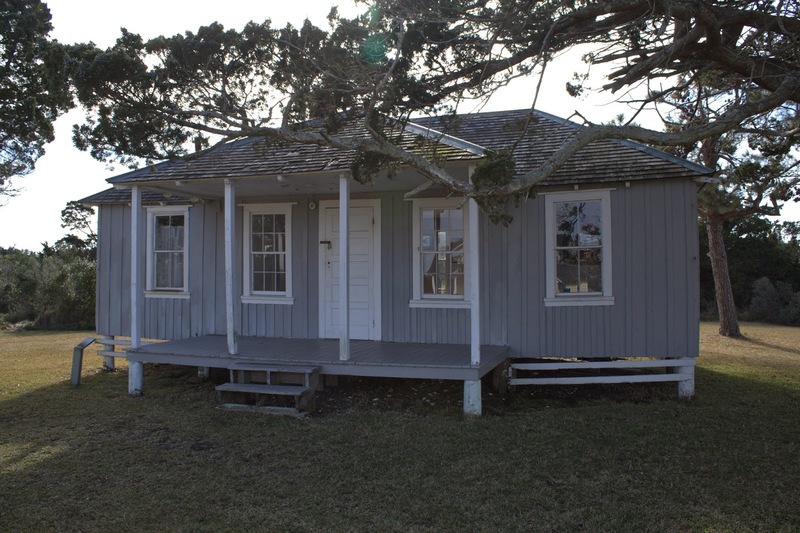 By the early 1800s a community schoolhouse was built in the vicinity of the Ocracoke Coffee Company. A new schoolhouse was built in the same area in 1825. 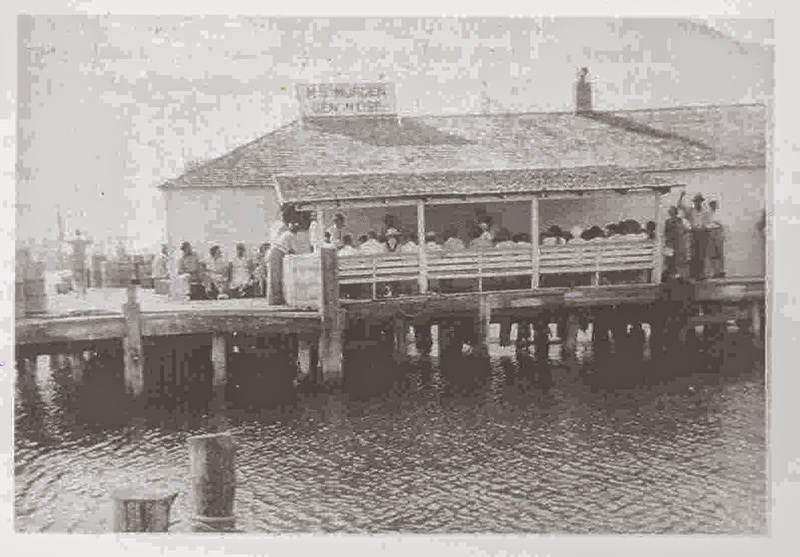 Sometime before the Civil War there were two community schools on the island. In addition, Sarah Owens Gaskill operated a private school near the lighthouse. In 1901 the Independent Order of Odd Fellows built a new lodge (it is today the center section of the Island Inn). They met on the second floor, and a "consolidated" public school was held on the ground floor. 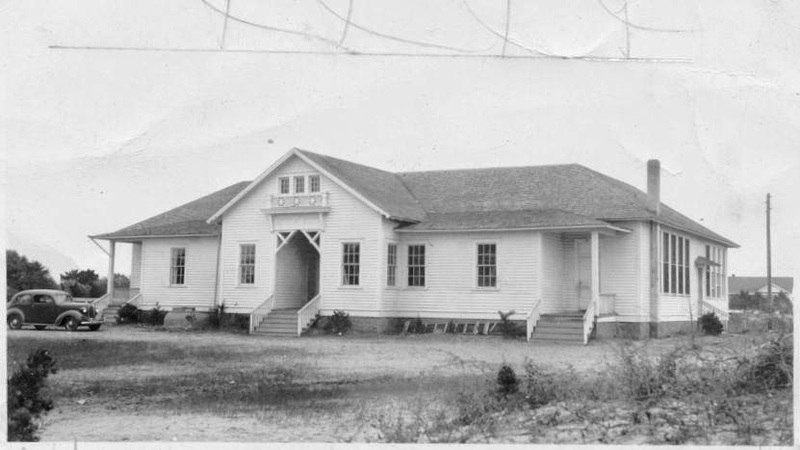 In 1917 a new schoolhouse was built at the location of the present-day building. 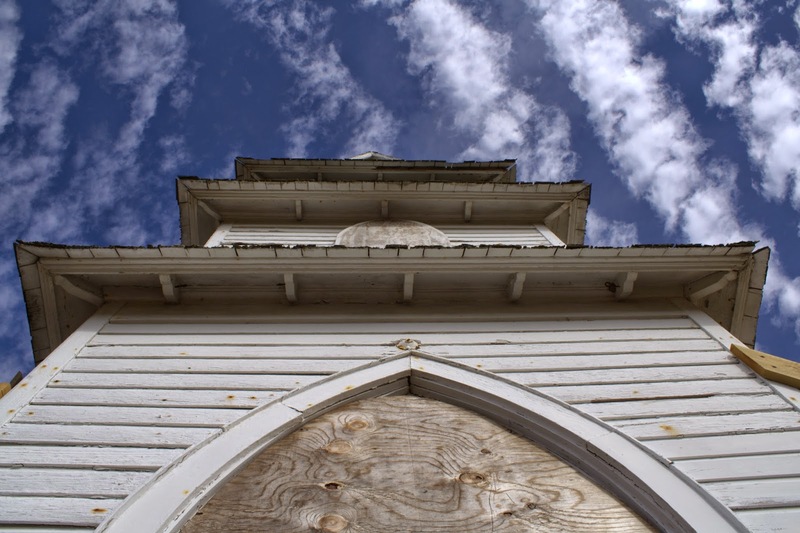 Ocracoke School has been an essential part of our community for many years. Cooperation between the school staff, parents, and other community members assures that island children consistently achieve lofty goals in academics and sports. 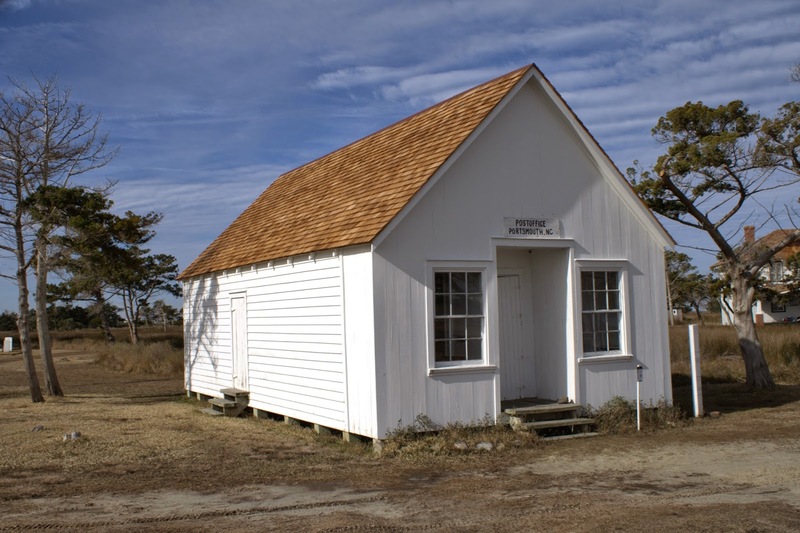 Click here for a recent article about the Ocracoke School. German U-Boat activity off the coast of North Carolina during WWII is well documented. Fewer people are aware of U-Boat presence in Carolina waters in 1918. Now is your chance to learn about this fascinating story. Both programs are free and will last approximately 1 hour. World War I touched the shores of Cape Hatteras, nearly 100 years ago, in 1918. Mr. Lowrey’s presentation will focus on archaeological and historical data of German U-Boat activity which threatened the North Carolina coast during World War I and will bring to life this little known, but all important, story of America’s maritime history. 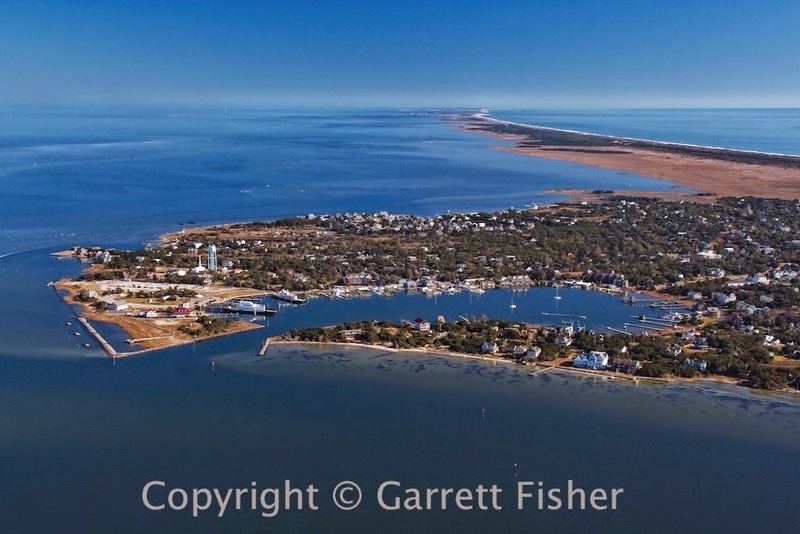 I recently discovered a wonderful blog with stunning aerial photographs of Ocracoke and the Outer Banks. Garrett Fisher (“author, adventurer & economic innovator”) and his wife are spending the winter in Corolla (horse section), working on two books - one from the air about the entire Outer Banks, and another about the wild horses. Fisher has already published a book with aerial photography of all 58 Colorado mountain peaks over 14,000 feet, and a separate one of the entire Upper Colorado River basin. He has also made aerial photos of the 40 peaks over 6,000' in the South, and the entire Blue Ridge Parkway. These will be published in two separate books. Click on the photo above, or here, http://garrettfisher.me/flight-nc-outer-banks-ocracoke-to-hatteras/, to see more outstanding photos of Ocracoke, Hatteras, Portsmouth and the entire Outer Banks from the air. Be sure to view all of Fisher’s Outer Banks posts. They not only document the spectacular beauty of these fragile barrier islands, but they illustrate the dynamic forces at work in the inlets. Take a look at his map to see the exact location where all of the photos were made. Many thanks to Garrett Fisher for permission to use his photo of Ocracoke Village. Look for his Outer Banks book at a future date. 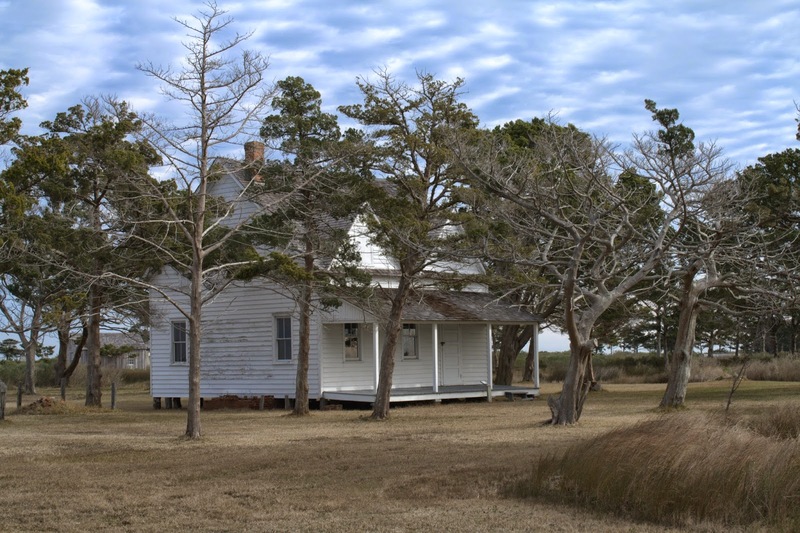 Our current Ocracoke Newsletter is the story of the murder of Willis Williams. You can read it here: http://www.villagecraftsmen.com/news112114.htm. I try to make at least one trip to Portsmouth Village every winter. This year I took my son and family (Stefen, Snee, Zoe, Eakin, & Eliza Howard). It was cool (in the 50s) with a few clouds earlier in the day...just perfect for enjoying a bug-free visit. Eakin took these photos. 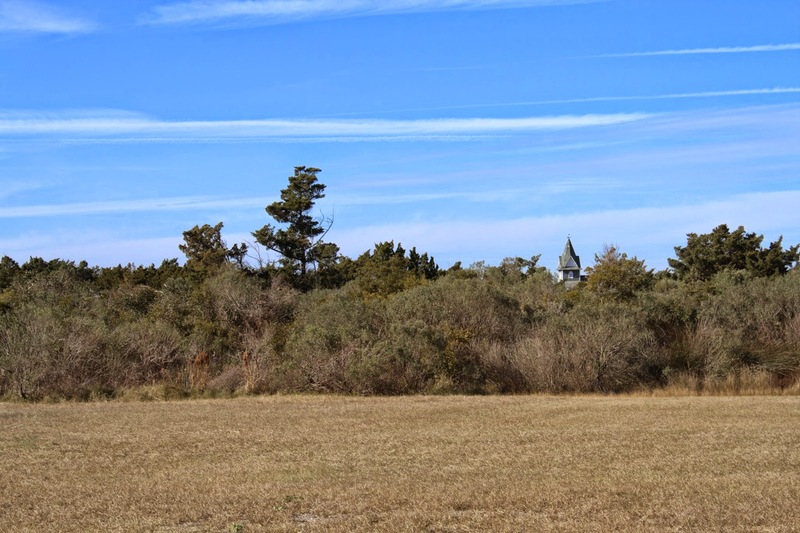 If you saw yesterday's post explaining why the public is not permitted to climb the Ocracoke Lighthouse, you know that my brief time off from posting on this blog is over. 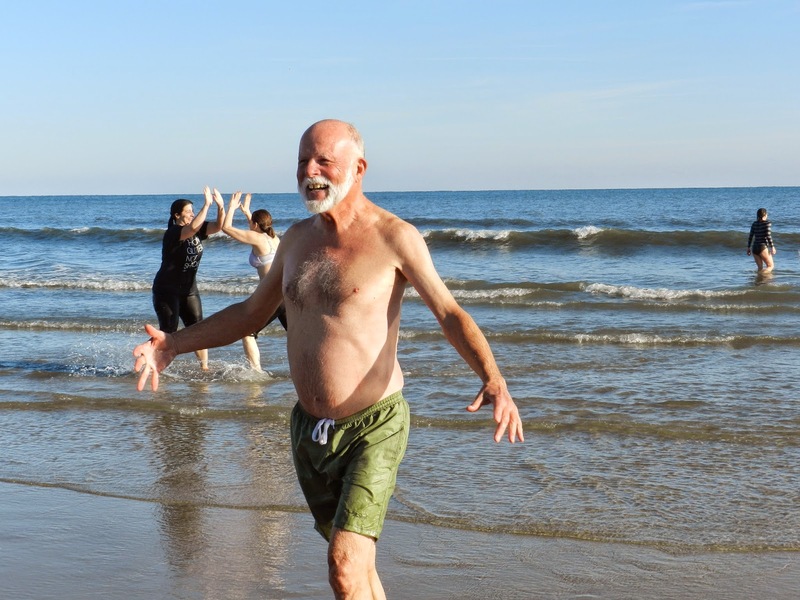 In addition to spending quality time with my family over the holidays, I had ample time to enjoy our beach; visit with friends; jump into the ocean on New Years Day; savor steamed, fresh oysters; and spend a day on Portsmouth Island. Below are a few photos. This is the time of the year for delicious, salty Pamlico Sound oysters. 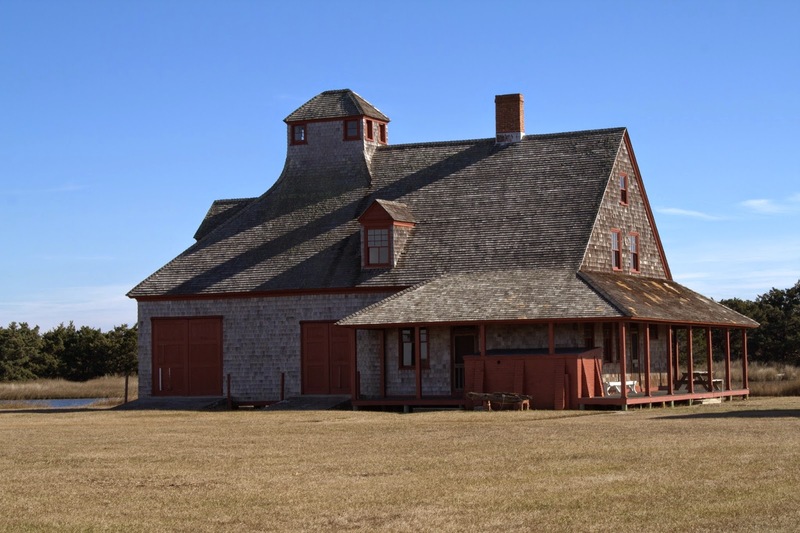 And, it's the best time of year to visit Portsmouth Island Village. No mosquitoes! I will publish more photos of Portsmouth tomorrow. It is good to be back posting on our Ocracoke Journal in the New Year! "...in the 1950's the original steps in the Ocracoke Lighthouse were removed because of rotting. The present steps are also bad from what I gather because you can not climb the light. It seems that the Hatteras, Bodie, Oak island lights are always having something done to them. Why hasn't the Ocracoke light been given the same attention?...." The condition of the spiral staircase is not the reason the general public is not allowed to climb the Ocracoke lighthouse. However, there are several good reasons for very limited access to the lighthouse. 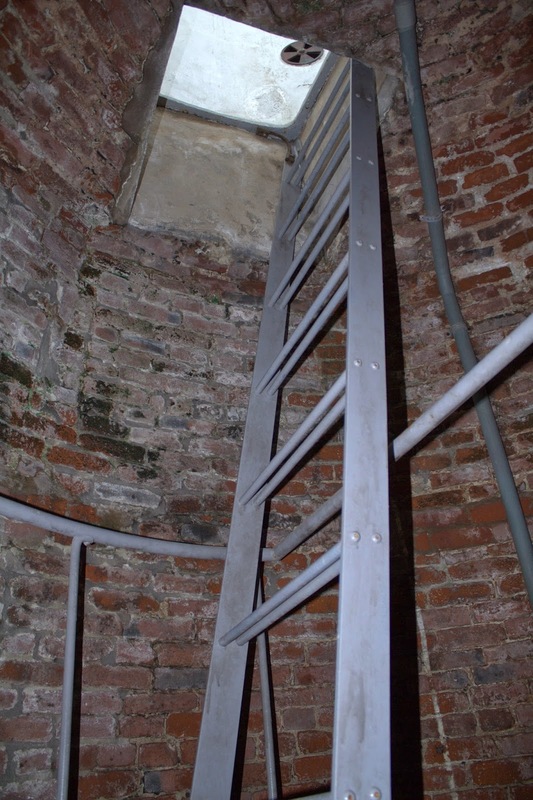 The metal spiral staircase, although sturdy and sound, is supported, not only by a central pillar, but also by horizontal steel rods anchored into the almost-two-century-old brick walls. Vibrations from hundreds of people climbing the stairs would surely weaken the connections and hasten damage to the historic structure. 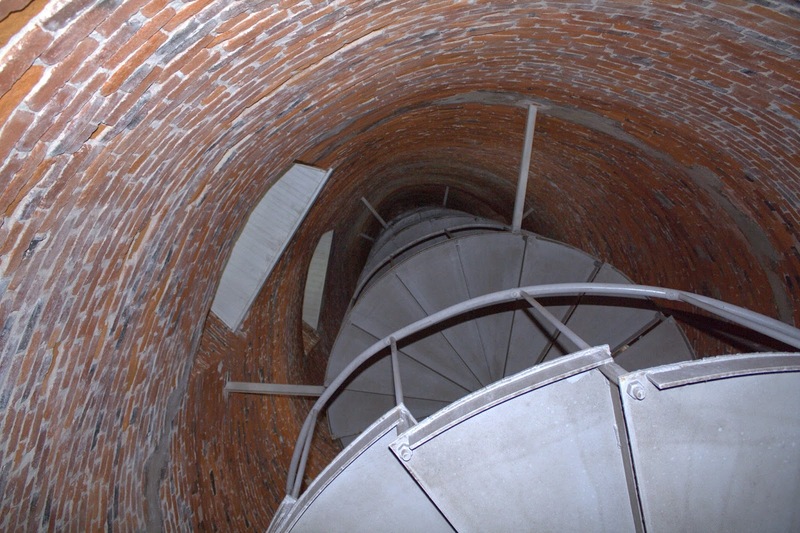 Even if a new free-standing staircase were to be installed, because of the interior design of the lighthouse the final 8 feet of the climb can only be accomplished by means of a narrow, steep ladder that will accommodate only one person at a time. Access to the lantern room is simply a hole in the floor, just wide enough for one person to crawl through. The metal hatch, when closed, prevents anyone from falling through and plummeting to their death, but also prevents anyone else from entering the lantern room. 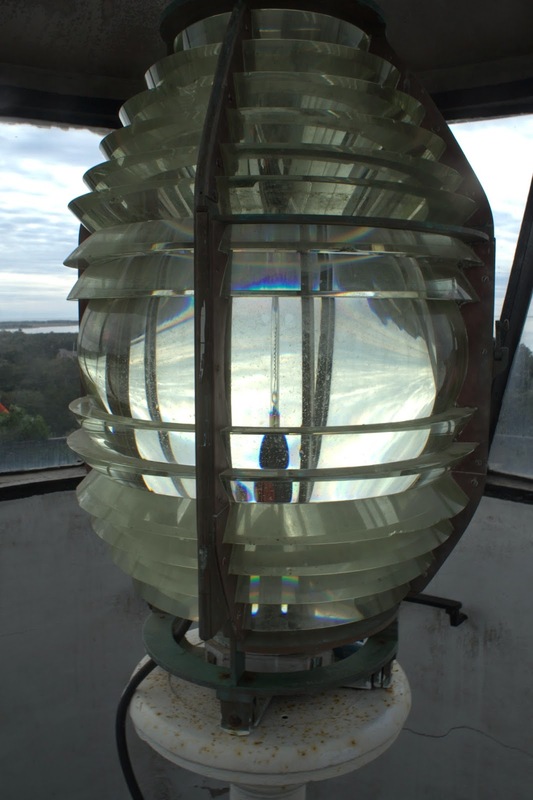 The fourth order Fresnel lens takes up most of the space in the lantern room, leaving only enough room for maybe six people to squeeze between the lens and the outside glass window panes. 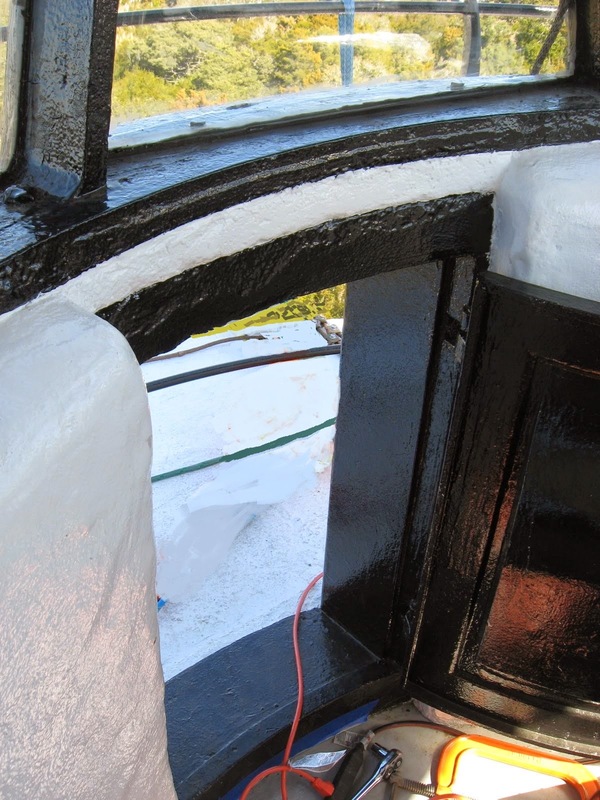 In such close quarters, damage could easily be done to the historic 1890 prisms surrounding the light. The door opening onto the balcony is only about three feet high. To get outside it is necessary to get down on hands and knees and crawl through the narrow opening. The railing around the balcony was not designed to hinder an adult crawling on all fours, or to keep toddlers or small children from slipping off the edge, and tumbling 75 feet to the ground. 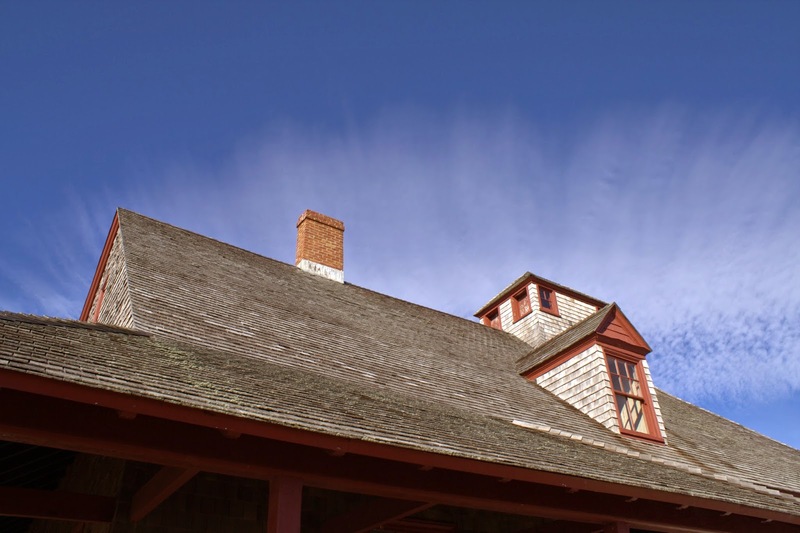 In a few words, the 1823 Ocracoke lighthouse, the oldest operating lighthouse in North Carolina, was designed for access by only one person, the lighthouse keeper, not a steady stream of the curious. To address the second concern...why hasn't the Ocracoke lighthouse been given the same attention as other NC beacons?...it has. Extensive rehabilitation work was done in late 2009 and early 2010. Below are links to our posts about that. I hope this clarifies questions any of our readers have about access to the Ocracoke Lighthouse. And I hope you enjoyed the photos of the interior of this historic structure. Be sure to check at the National Park Service Visitors Center when you are on the island. Even though climbing is not permitted, Lou Ann and other volunteers periodically open the ground floor of the lighthouse for visitors.